With today’s audio and video technology advancements for PCs, laptops and mobile devices, businesses may be more tempted than ever to outfit their conference rooms using a DIY approach. While this sounds like a great idea in theory, there are a few considerations to keep in mind… DIY rooms often lack the proper equipment to host a really great meeting. Whether you’re just getting started or already have a few rooms installed, be sure to check out these tips for an optimal experience, for all meeting participants. Pick the right computer. Real-time video communications are process-intensive, and require a computer with a current operating system, as well as sufficient RAM, storage, and processing power. Do be sure to have users bring their own laptops (which hopefully are updated regularly) or install a computer in the room that is managed and regularly updated by your IT team. Don’t view your conference room as a dumping ground for the old laptop no one is using. Chances are, that laptop doesn’t have the computing power required for a successful video call. Choose your camera wisely. A standard webcam only has a 60-degree field of view. This isn’t sufficient for a group meeting. One of the biggest challenges for remote participants is seeing everyone in the room and knowing who’s speaking when. Do invest in a camera designed specifically for use in conference rooms. Wide-angle, HD cameras are designed to let you see everyone at the table. Huddle, don’t cuddle. Don’t count on a consumer webcam to squeeze everyone into the camera’s field of view. Quality audio is at least as important as video. Omni-directional mics/speakers are critical when you have multiple participants in the room. How many times have you been on a call where you can’t hear the far end because they’re using an audio device designed for a single speaker? Do invest in a speakerphone that’s designed to be just that. Don’t use your laptop speaker, desk phone speaker, or smartphone speaker for a meeting. Those at the far end simply won’t be able to hear all participants. Check your Internet connection. Any video meeting requires a high-speed Internet connection. Anything less won’t do. Do use a wired connection whenever possible. Wired will almost always ensure better audio and video quality than wireless. Don’t host your meeting over a cellular network. The quality mostly likely won’t be good, and unless you have unlimited data, your usage will really add up too. Display. Consider how you’ll be using the display(s) in the room. Will you be sharing content and using video conferencing at the same time? Do you want a touchscreen/interactive panel for marking up content, etc.? Don’t huddle around a laptop and use that as your video/content display. Consider room lighting, acoustics, etc. The physical room environment is also key to a successful meeting. Do aim to use lighting that is favorable for video conferencing, e.g. natural light that evenly lights the entire space. Whenever possible, choose rooms that are outfitted with acoustic treatments, covering a single wall with acoustic tiles or fabric can make a big difference. Don’t choose rooms that are dimly lit, excessively bright or are filled with hard flat surfaces for sound to bounce off of. Of course there are other considerations that aren’t covered in this summary. We’d love to hear your thoughts, feedback and DIY meeting room experiences. 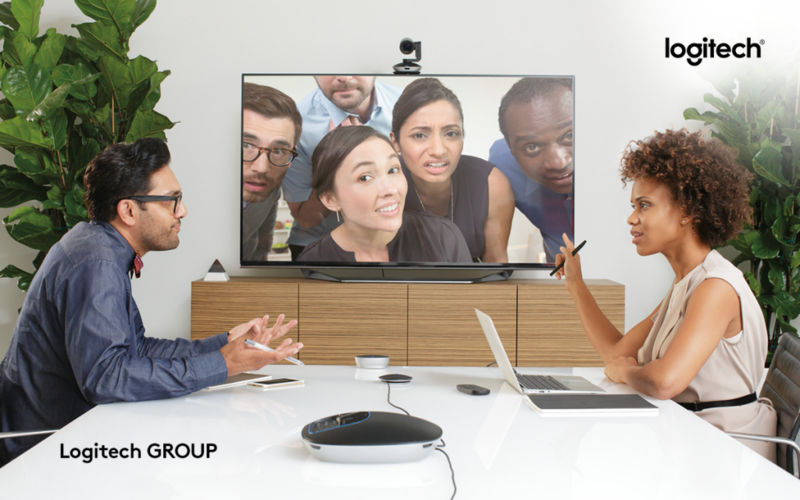 To learn more about your options for the modern-day meeting room, visit the Logitech website.